Ensure all whisky's are ice cold and add 25ml Bells whisky, 25ml Jack Daniels and 25ml Southern Comfort to a shot glass. Garnish with a wedge of lime. 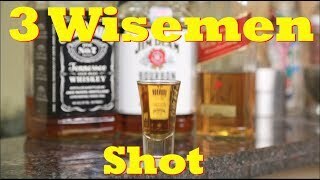 How to Get Drunk - The Three Wise Men Shot - The 21st Birthday Shot!